South Gloucestershire Council’s Leader and Deputy Leader battled through the elements over two days last week to complete a 230km bike ride for Children’s Mental Health Week. Cllrs Toby Savage and Jon Hunt, who are also the Cabinet Members for Schools, Skills and Employment, and for Children and Young People respectively took on the challenge for charity Place2Be, cycling to every one of the 121 schools in South Gloucestershire Council to highlight the importance of the awareness week (February 4-10) and its message “Healthy: Inside and Out”. Pushing through Yellow Weather Warnings, strong winds and icy rain on Thursday and Friday (7 and 8 February), the pair visited a number of schools on the way that have received grants of £1,000 or £2,000 to find out about the work being done to make a difference for the mental wellbeing of pupils. 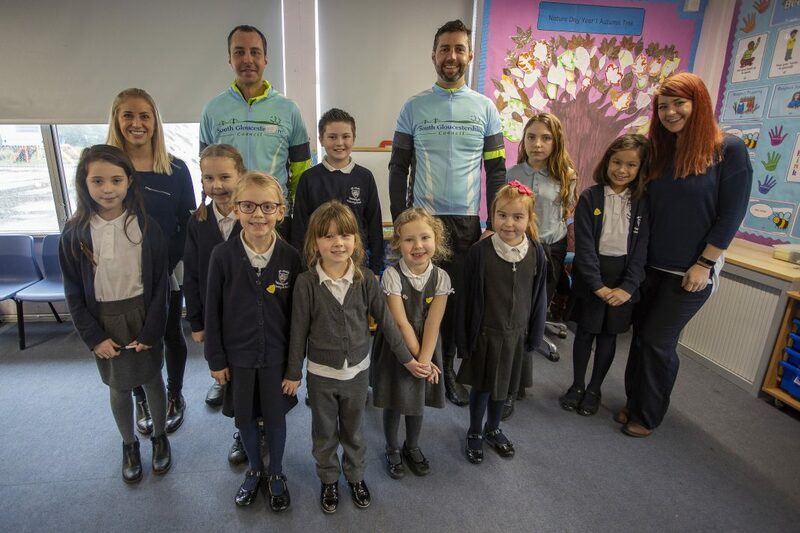 Both relatively novice cyclists, Toby and Jon trained for only a month leading up to the ride, taking to the roads of South Gloucestershire whenever possible, and also receiving assistance and advice from reigning Paralympic, World and European Triathlon Champion Andy Lewis MBE. Cllr Toby Savage, Leader of South Gloucestershire Council and Cabinet Member for Schools, Skills and Employment, said: “I am not an experienced cyclist by any stretch of the imagination. This ride was the most challenging physical feat I have ever put myself through, and that was before the horrendous weather set in – but if it wasn’t going to be hard, it wouldn’t be worth doing! Cllr Jon Hunt, Deputy Leader of South Gloucestershire Council and Cabinet Member for Children and Young People, said: “Keeping ourselves going as the weather got worse was tough, but each time we visited a school and heard about the work being done by schools and pupils to make a difference it gave us that added motivation to keep the pedals turning. Catherine Roche, CEO of children’s mental health charity Place2Be, said: “Toby and Jon’s bike ride very much embodies the Children’s mental Health Week theme of ‘Healthy: Inside and Out’ and we hugely appreciate such activities that raise awareness. Congratulations to them both for finishing their mammoth challenge.